The Integrated Catholic Calender: October 1997. Memorials of the Saints; etc. 1 St. Theresa Lisieux; Patroness of the Missions, Aviators, Florists. 5 TWENTY-SEVENTH SUNDAY OF THE YEAR. 12 TWENTY-EIGHTH SUNDAY OF THE YEAR. TWENTY-NINETH SUNDAY OF THE YEAR. 26 THIRTIETH SUNDAY OF THE YEAR. Bl. Bonaventure of Potenza, priest, I Order of Franciscans. 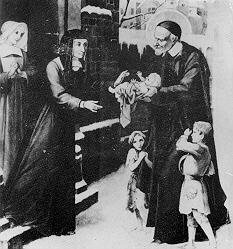 St. Vincent de Paul, Patron Saint of Charity.